Dr. Hans Gann grew up in rural Osage County where he graduated from Barnsdall High School in 2001. Growing up on a farm with a menagerie of pets and being actively involved in the local 4-H chapter caused Dr. Gann to develop a love for animals at a very early age. He attended Oklahoma State University (Go Pokes) where he received a Bachelor’s Degree in Animal Science in 2005 and graduated with his Doctorate of Veterinary Medicine in 2009. Dr. Gann moved to Tulsa following graduation, where he lives with a small herd of dogs, a bird and about half a dozen fish. In his spare time, he enjoys traveling, spending time with family and friends, going to the lake, and working on his house. Dr. Gann joined the Edgewood team in September of 2018. 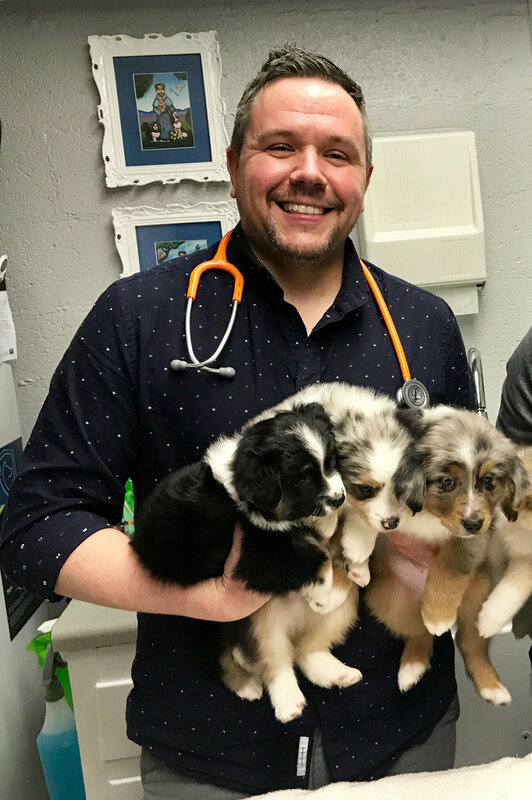 Dr. Greg Daubney is the heart and soul of Edgewood Veterinary, after graduating from Oklahoma State University in 1983 he started his career at small animal clinic in Abilene, TX. It wasn’t long before his hometown of Tulsa was calling his name and he moved his young family back home so that he could work at Edgewood. Since 1984 Dr. Daubney has devoted his time, passion, and energy to serving generations of pet loving families in the Tulsa area. His gentle nature and compassion is felt not only by the countless patients he has served but by the pet owners too. Dr. Daubney can often be found sitting with a client or on the phone discussing in detail any questions they may have about their pet’s care. When the doctor is not with a patient or visiting with a client he is spending time with his family, working outdoors, fishing, or hiking with the dogs! Stop by and say hello some time! Dr. Brad Howard is Edgewood’s skillful surgeon and has been providing excellent diagnostic and surgical care to our patients for over 15 years. Dr. Howard is also a graduate of Oklahoma State University, Go Pokes, and is seldom seen without his OSU orange watch! Dr. Howard’s joyful and charismatic nature helps keep everyone at Edgewood motivated and upbeat. Patients and clients too appreciate his positive attitude, thorough nature, and attention to detail as he sees them through their pet’s care before, during, and after surgery. Kristi joined us in 2011 and is the smiling face that greets so many of our wonderful clients as they come in the door. Kristi has the biggest heart and treats every dog and cat like she does her own. Not even one month after joining our team, Kristi already the proud pet parent of 5 boisterous canines, welcomed a poor puppy abandoned at our doorstep to her home. Kristi always makes sure each pet that comes through our door feels safe and secure. She makes a point to attend to their individual needs whether that is finding the pet a quieter place to rest, providing extra blankets for our senior pets, or giving extra walks to active and young pets throughout the day. Before she leaves, Kristi always does one last walk through to make sure each cat and dog is comfortable and relaxed! Missie started her veterinary assistant career in 1982. She has worked for several veterinary practices; including the Tulsa Animal Shelter and the Tulsa SPCA. She has been a member of Companion Dog School of Tulsa for 30 years where she teaches Puppy Kindergarten classes. For the past 35 years Missie has run the Green Country Pembroke Welsh Corgi Rescue. She is also a member of Gaitway Pembroke Welsh Corgi Club and the Pembroke Welsh Corgi Club of America. Married for 37 years she has 2 sons and a future daughter-in-law. Missie is pleased to be a part of the Edgewood family and enjoys meeting all of the clients and their furry family members. Originally from Little Rock, Arkansas, Amanda moved to Oklahoma to attend the University of Tulsa, majoring in biology and minoring in Psychology. She graduated in May 2018 and joined our team shortly after. You will see Amanda all around Edgewood, welcoming our clients and their pets into the clinic as well as assisting our doctors with daily appointments. Amanda loves working with animals and hopes to become a veterinarian in the near future. Two of her favorite things about working at Edgewood is gaining lots of experience with knowledgeable veterinarians and talking with pet owners both in and out of the exam room. Amanda is excited to be a part of the Edgewood family and looks forward to working with all of our wonderful clients and furry friends!